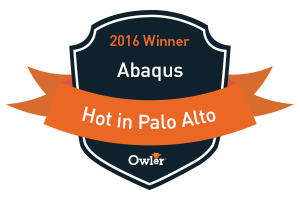 Abaqus, Inc., a provider of the myGeoTracking cloud-hosted mobile workforce management and transportation support platform, was recognized with a “Hot in the Silicon Valley 2016” award by Owler, the crowdsourced competitive intel site for the tech industry. Each year, Owler recognizes the top trending companies in cities around the world. We sifted through the over 15 million companies on our platform to find the most award-worthy businesses, and wound up with 4,500 award winners across the 600 most popular cities on Owler. Recipients are chosen based on several different metrics, including their number of followers on Owler, insights collected from our community, social media followers, and blog posts over the past year. The myGeoTracking service can be delivered via a low-touch app or through a 100% cloud-based service feature that requires no app and works on any mobile device. The service is highly customizable, can support and integrate with your back office ERP systems, and provide a wide range of time clocking and accountability options, custom reports, enterprise messaging, activity alerts and more. Abaqus, Inc., based in Silicon Valley, CA, is a leading provider of cloud-hosted, carrier grade field service management and transportation logistics solutions that help SMB and Enterprise businesses better manage their mobile employees and assets, improving productivity and accountability, while reducing payroll and operations costs. The myGeoTracking platform enables solutions across a wide range of industries, from mobile field force companies, healthcare providers, facility management companies and trade services companies to 3PL, transportation and freight brokering companies. Abaq.us also provides highly customized workforce automation solutions tailored to match your company’s needs.